Interesting how the fates of two nearby prehistoric settlements should go in such different directions. Take for instance Iader and Aenona, both Liburnian towns on the Dalmatian coast, within about 14 km (9 miles) of each other. Both were mentioned by Pliny the Elder some 3,000 years ago. 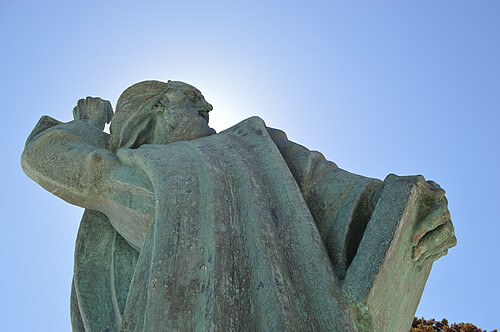 Iader is now a thriving city with a university and a bustling harbour – known these days as Zadar. 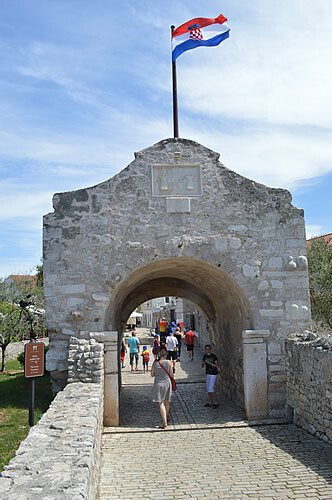 See Exploring the Dalmatian Coast – the ancient city of Zadar for our impressions. 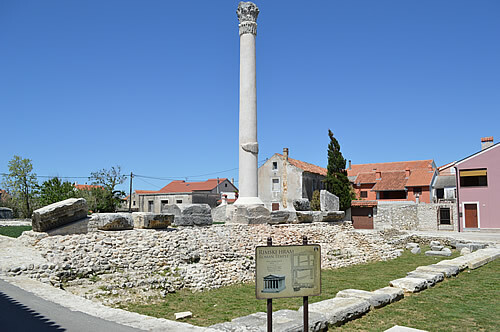 Aenona, founded by the Liburnians in the 9th century BC, become an important municipium in Roman times, and a royal city during the early Croatian kingdom. Its name changed to Nona in medieval times, and is now known as Nin. Never heard of it? Tellingly, if you Google Aenona or Nona, all sorts of fascinating history and archaeological snippets appear, but search for Nin and all you’ll see is apartments and beach holidays! Oh, and mud. So what is so interesting about Nin? Let’s start our tour just outside town, where the tiny 12th century church of Sv Nikula (St Nicholas) stands all by itself on a large mound. The surrounding countryside is flat, and this small hill is a tumulus, a Liburnian burial site, possibly of some important chieftan given its size. 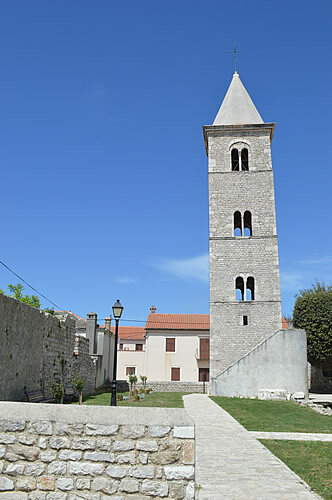 The church dates from the 12th century, and Croatian kings were crowned here. 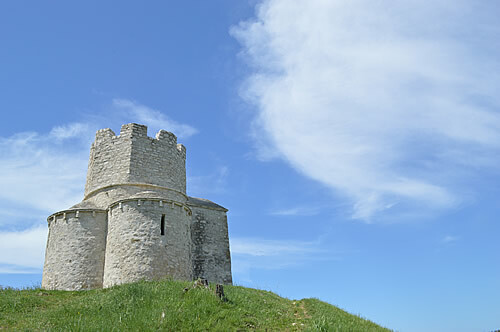 The original church was later augmented by a battlemented tower, giving it the look of a fortress. In 1884, British architect Sir Thomas Graham Jackson visited, and took the time to sketch the church. I love reading his descriptions of buildings, especially when as in this case, we can’t get inside to see for ourselves. According to Jackson “In plan it is a Greek cross, all four arms being equal in length, but the choir and transepts are apsidal and covered with semidomes, while the nave is square in plan, though it too is roofed with a semidome, carried on the conch-shaped squinches in the angle of the square which abound in these early Dalmatian churches.” Squinches, huh? Had to look that one up – a squinch is the rounded bit that fills in the corner of a square room so you can build a dome on top. I really must try and work that into a conversation sometime! 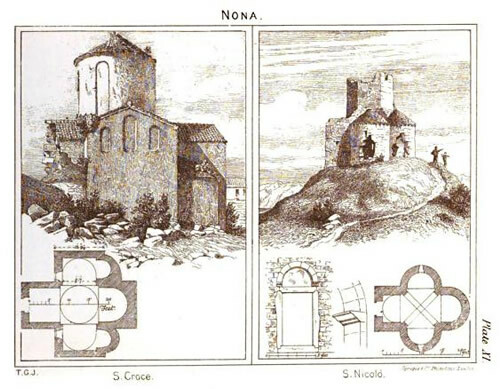 On the left of Jackson’s illustration is Sveti Križ (Holy Cross) in the centre of Nin itself. We’ll get to that in a minute. The old heart of Nin is on an island set in a lagoon, with two stone bridges crossing over to it (the current ones are from the 16th century). 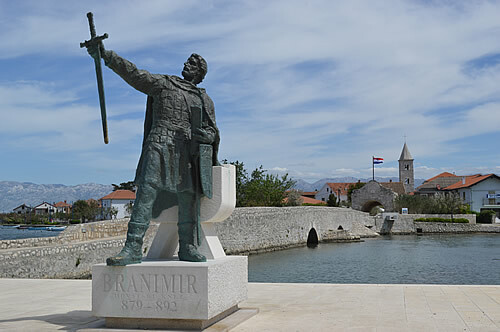 Greeting you beside the tourist office is Branimir, who ruled Croatia as duke (knez) from 879 to 892. He broke with the Byzantine influence, moving closer to the Pope in Rome. In 879, Pope John VIII gave his blessing to Branimir and the Croatian people, the first time the Croatian State was recognized officially. And today the Order of Duke Branimir is one of the highest State honours bestowed by the Croatian government. 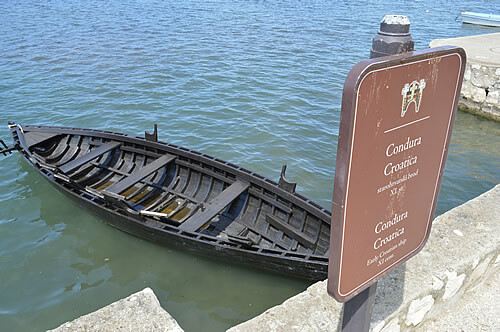 At the other end of the bridge is a working reconstruction of a medieval 11th century boat known as Condura Croatica. Its design was apparently modelled on an earlier Liburnian galley, the remains of which are on display in the museum, along with images of what they would have looked like under sail. The Liburnian settlement of Aenona was surrounded by defensive walls. 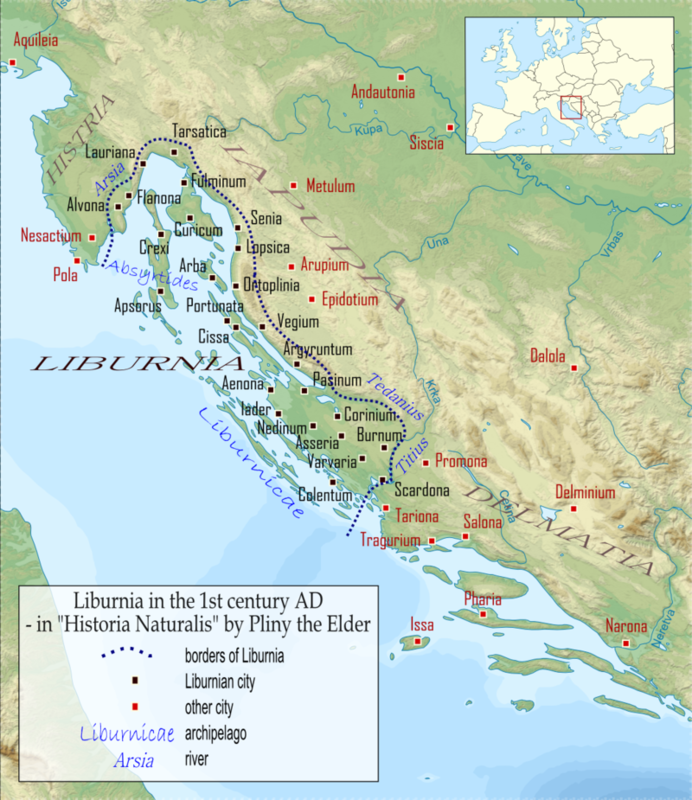 From the evidence available, it would seem that the townsfolk were fairly prosperous, as the Liburnians traded over the entire Adriatic, and well into the Middle and Eastern Mediterranean. What we mostly know about these Iron Age people comes from grave sites. Tumuli, such as the one under the church of Sv Nikola are fairly common all over Liburnian territory, and particularly so in the area around Nin. After the failure of the Illyrian rebellion, in 9 AD Aenona fell under Roman rule. The defenses were expanded, and the island was connected by two bridges to the mainland and a road to lader (Zadar). In typical Roman fashion, the road was lined by graves. The remains of an aquaduct have been found in the fields, and many inscriptions from the area indicate that the romanized Liburnian population still kept some of their own traditions. By the year 500 Aenona was under the Ostrogoths, and at the beginning of the 7th century the Croats arrived. 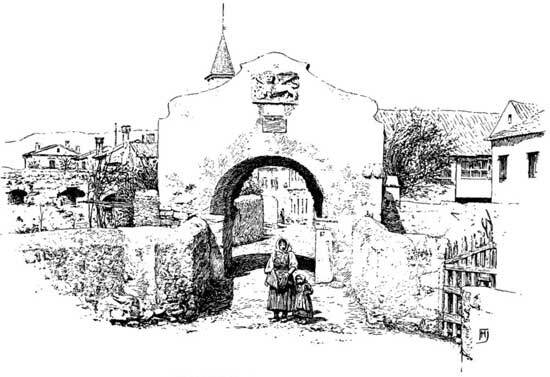 The gate into town is part of the medieval fortifications which were constructed on top of the Roman walls, which were in turn built on the Liburnian walls. Interestingly, in the sketch below by F. Hamilton Jackson from the late 1880s, the gate clearly has a different emblem – more like a Venetian winged lion. At some point in the renovations that’s been changed out. I wonder if that’s the lion carving I saw in the Nin Museum? For the Croats, Nin was the political, religious and cultural centre of their medieval State. 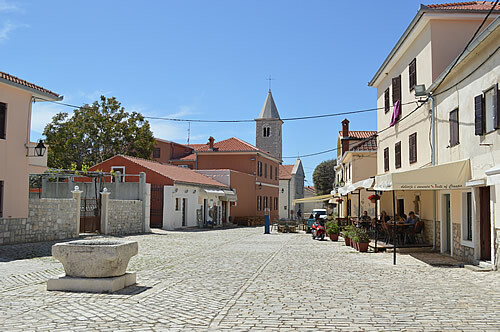 It’s the oldest Croatian royal town, the seat of first the dukes (Višelav, Trpimir and Branimir) and later the kings (Tomislav, Petar Krešimir IV and Zvonimir). The very first Croatian king Tomislav was crowned at Nin in 925. 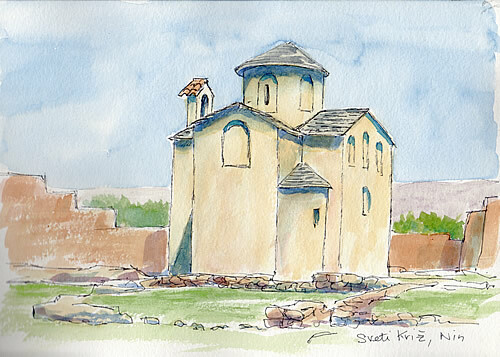 The church of Sveti Križ (Holy Cross) is known locally as the smallest cathedral in the world and is the other church in Thomas Graham Jackson’s drawings shown above. 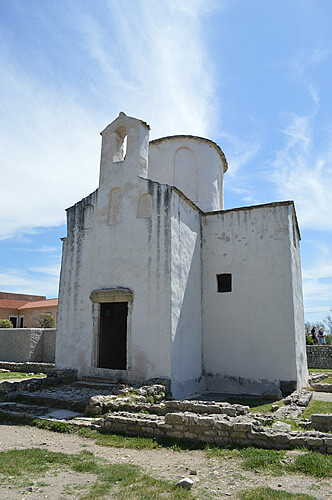 Dating from the 9th century, Sveti Križ is one of the symbols of Nin. Basically it’s a Greek cross, but there are some irregularities in the ground plan, and it’s believed that was purposely done, and the building functioned as a clock or calendar. It’s said that Sveti Križ was aligned so that the sun’s rays would enter the upper western windows and fall on Duke Višeslav’s font on the feast day of St Ambrose. More of that font when we reach the museum. During the time of the early Croatian State, Sveti Križ was both a cathedral and the chapel for the nearby Prince’s Palace. Around the church are around 170 medieval graves (~ 8th-15th century), and the remains of some of the housing from that time. Sadly, not much still stands. In her book, The Adriatic Island & Corfu, Celia Irving has a lovely description of Nin as it struck her in the 1960s – “Like Pompeii, it draws me back through the centuries“. So true. You could imagine all kinds of historical pageants in and around this lovely little church. 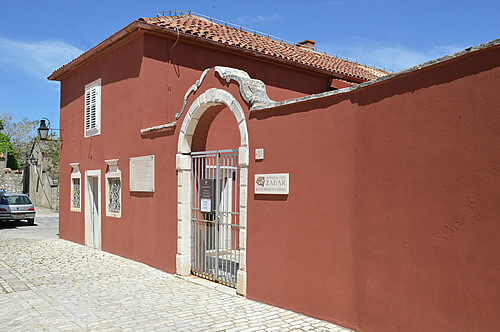 Over in the main street is the pretty little Museum of Nin Antiquities. On display are just some of the fascinating archaeological finds from around the Nin area going back to medieval, Roman and prehistoric times. 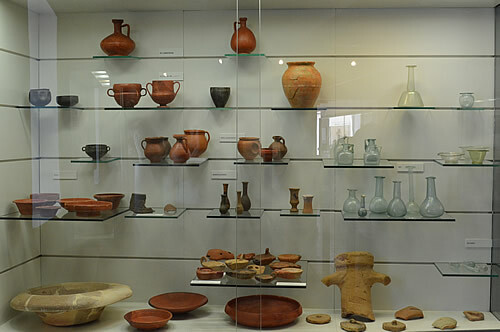 Some of the larger and more important treasures can be found in the Archaeological Museum at Zadar, or in the Museum of Antiquities in Split. 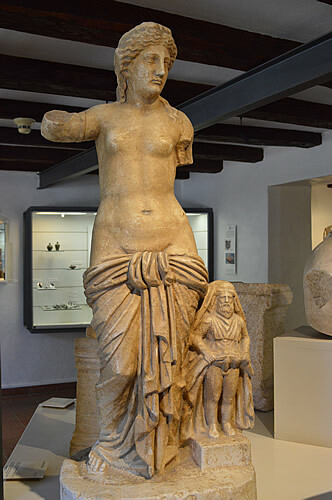 As you enter, there’s a rather striking 1st century AD marble statue of the goddess Venus-Anzotika with a small Priapus (her son by Dionysus). For the Liburnians, Anzotika was a cult figure, a symbol of motherhood, fertility and plenty. The marble was imported from Carrera, and probably crafted in Nin or Zadar. Now why did they bother putting a robe on that guy at all? The first mention of an archaeological dig in Nin was in 1777. Given all its treasures, it’s been of interest to archaeologists ever since, though it really seems like there is a whole lot more to find. Part of the trouble is that each layer is valuable, but most of what’s been investigated is the Roman period. For the early archaeologists, antiquity is by far the most important time, and to be honest, monumental Roman remains must have been be easier to find! If only the early Liburnians had taken to writing! 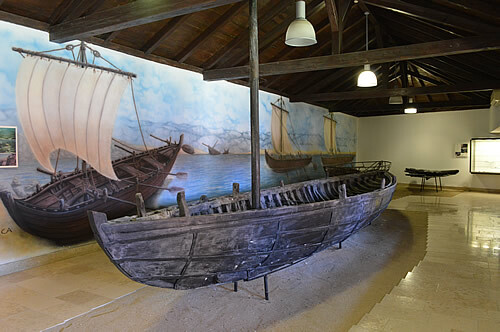 The room dedicated to the old boats is a great display with a large mural to give context. Here’s the description: The remains of a 10 metre long ship from the 1st century BC were found in Zaton near Nin – the ship’s keel with the bottom planking made of 6 rows of wooden boards on each side, joined together and sewn with resin cords and wooden wedges in the Liburnian traditional style known as “Serilia Liburnica“. The planks are oak and beech, while a vine was used for the cords. A later 10th century ship of identical form and size, held together with wooden fittings instead of sewn, was found in the same place, the “Condura Croatica” used by the Medieval Croats – the working model of which we saw next to the bridge. Condura could well be the closest known vessel to an original Liburnian galley, only much smaller, with the features of a quick and agile galley, having a shallow bottom, very straightened but long, with one large Latin sail and a row of oars on each side. Višeslav was another of the early Croatian dukes, the first Croatian ruler to be baptised. 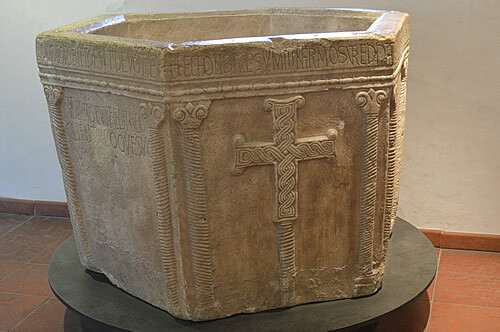 The ceremony took place in Sveti Križ around the year 800, in a specially commissioned baptismal font. The original, currently on display at the Museum of Croatian Archaeological Monuments in Split, was carved from a single block of marble and is large enough to fully immerse an adult. The latin inscription on the outer rim translates as: This font receives the weak and enlightens them. Here they are cleansed of sin, inherited from their first parent, to become Christians soberly confessing the eternal Trinity. This work was piously created by Ivan the Priest at the time of Prince Višeslav, in honour of St. John the Baptist, to intercede on behalf of him and his flock. Interesting to see the twisting pattern on the cross, which is what I’d always associate with the Celts. But of course, I’m sure they were around here too. 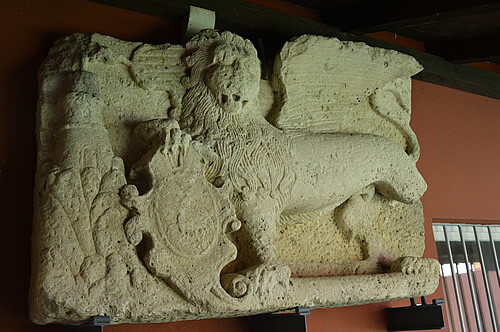 Below is the carving of the winged lion that I think may be from the entry gate. This isn’t your usual Venetian lion as its paw would be resting on a book, but this may be the symbol of Nin under Venetian rule, and the local crest under the paw. 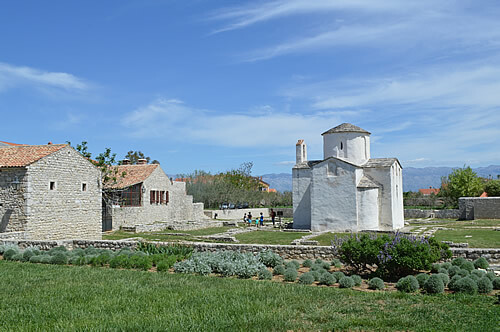 Nin was the first Croatian diocese from the 9th century onwards. Of all its bishops, the most famous is Grgur Ninski – Gregory of Nin. If you’ve been to Split, perhaps you’ve rubbed his toe for luck? The huge imposing bronze statue there of Grgur Ninski by Ivan Meštrović has its twin here in Nin, although at a smaller scale. We still rubbed his toe for luck, though! So what was Grgur famous for? For campaigning vigorously to use the slavic language in church services, as part of a wider movement for Croatian independence. 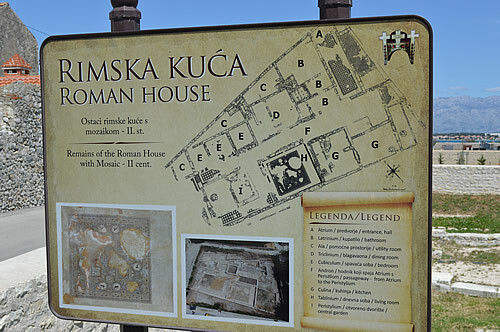 Around town, we have a Roman Villa with mosaics, next to the Forum. The mosaics were obviously not on show out here in the open, but are apparently lovely with floral and geometric motifs dating back to the first half of the 2nd century. Some of the best quality mosaics found on this side of the Adriatic were found here – I wonder where they can be seen now? Will have to look into that! In case you find it difficult to work out what’s what in those walls, here’s the notice with the floorplan. Apparently not all Roman villas were designed the same. It makes sense, doesn’t it, that they would take local conditions and preferences into account? During Roman times, Nin was an important municipality with a seaport, and the findings from this house suggests a fairly wealthy and pleasant lifestyle. 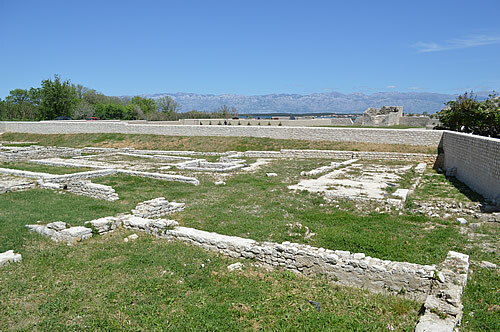 Nearby is the old Roman Forum, with the remnants of a big Roman temple (45 x 21.5 m), the largest to be excavated so far in Croatia. It dates back to the time of Emperor Vespasian (69-79 AD), whose name is on the inscription on the frieze of the temple facade. The temple was divided into two parts: the sanctuary (cella) on the western side and a porch in front of it on the east side, both of similar size. The cella itself was divided into three, each area having two pillars to each side. In front of the cella was a porch with six columns. At the entrance was a grand set of steps, whose foundations can still be seen. That building would have fairly dwarfed the modern day houses around it! When Dalmatia came under the control of Venice (1409), Nin’s importance began to fade. The Venice government gave the order to burn the town and systematically destroy it so the Turks couldn’t have it. It’s said that Venice sacrificed Nin in order save Zadar. Nin was destroyed twice: first in 1571 and finally on 28th of April 1646. Its monuments, several churches, King’s palace and the Bishop’s palace were left in ruins. Now here’s my own sketch of Holy Cross Church, actually done on site in the heat of the day (not recommended!) It was a very hot day wandering around in sunshine. Now, what was that about mud? Around the area of Zaton, there are medicinal mud baths that are certified to help all kinds of aches and pains. Nin is also home to a large Salt Works, which has been going since ancient times. Sadly, I have no pictures as we didn’t get to do the tour due to a large party of schoolkids. In Roman times, salt was an important commodity, and could be exchanged for gold, ounce for ounce. Today, the Nin Salt Works produces sea flower salt in the tradional way, just like the ancient Romans.